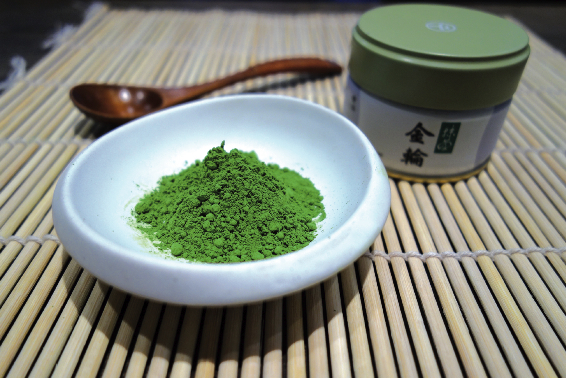 The matcha powdered tea of the Uji region has been closely tied to the tea ceremony from long ago. The Uji region is known throughout Japan as one of the country’s finest tea growing regions. The father of tea making in this region was the monk Myoe, who is said to have cultivated the plant in the Kamakura period (1185 to 1333), from the very first years after it had been brought over from China. He sought a suitable environment for tea and settled on the fields of Uji, shrouded in deep mists from the river. Over time the reputation of teas from Uji spread, and by the time the Shogun Ashikaga Yoshimasa had established the superb tea fields known as the “Six Great Plantations of Uji” in 1390, it had become the best tea growing region in the land, achieving fame far and wide. The tea ceremony, known in Japanese as “Cha no Yu”, in which matcha powdered tea is prepared and enjoyed, first began in the Muromachi period (1336 to 1573) and was finally perfected by the renowned Sen no Rikyu. At this time, Uji tea growers were looking for the method that is the best for tea and this finally lead to the great results, with a very fine quality matcha that then spread alongside the tea ceremony and became desired by every tea aficionado across the nation. In addition, many of the powerful rulers over Japan’s history also contributed to the prosperity of the Uji region and further cemented Uji matcha as inseparable from the tea ceremony. The matcha brewed in the tea ceremony can be divided into weaker “usucha” (lit: dilute tea) and stronger “koicha” (lit: concentrated tea). Just as these names suggest, the first one is made with a small amount of powder for a thinner consistency, while the second uses much more and is made by kneading it for a completely different, thicker texture. The style of the vessels and implements used in making these two varieties are also different. The brand being showcased this month called Kinrin, is a type of matcha mainly used to make the thicker koicha style of tea. It is a top quality blend made using only the best quality new shoots from the oldest tea trees, said to give the deepest flavour. The producer, Marukyu Koyamaen was founded in 1668. They supplied Shoguns such as Toyotomi Hideyoshi and the Tokugawa dynasty for over 200 years and continue to provide tea to tea ceremony practitioners from the most famous lineages, including the Omotesenke and Urasenke. It goes without saying that Kinrin matcha has a natural sweetness and fresh aroma and it also contains higher concentrations of polyphenols than most teas, being highly regarded as a health drink. It can also be used as cosmetics, to help maintain the health of the skin.